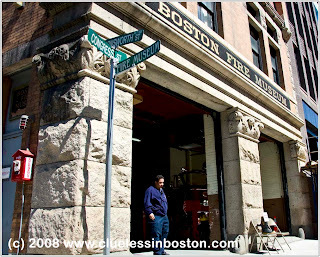 Today's doorway is the Boston Fire Museum on Congress Street. Tomorrow I will show you what lurks in the other doorway. I'm sure you can see it if you enlarge this picture. It looks like a red fire truck but am not sure that is what is really in the other side. I like your photo today and also enjoyed poking around in your post yesterday. Neat. Beautiful archetecture! I suppose I'll have to wait till tomorrow to find what's on the other side! What a beautiful old building! I'm anxious to see what is on the other side tomorrow. Interesting! I can't wait to see what lurks behind the other door! !